Is now the right time for first home buyers? First home buyers are clearly ramping up across the housing market. The most recent data from the ABS showed a surge of first home buyers in July, with the number of housing finance commitments reaching the highest level since November 2013. First home buyers now represent 16.6% of the owner occupier market, which is the highest proportional level of activity from this segment in four years. So why are first timers rushing back into the market? There are a few reasons. New stamp duty concession went live in July across New South Wales and Victoria. Under the changed rules, first home buyers in New South Wales receive a full stamp duty exemption if buying a dwelling priced under $650,000, while in Victoria the rules apply to properties under $600,000. In NSW, this equates to a potential saving of nearly $25,000 and in Victoria, where stamp duty rates are higher, the potential first home buyer saving is more substantial at just over $31,000. With housing affordability an ongoing issue in Sydney and, to a lesser extent, Melbourne, the savings on stamp duty provide a decent leg up for first home buyers, so it’s understandable that many would be taking advantage of the incentive. First time buyers in Sydney and Melbourne should be aware that these incentives have come after five and a half years of solid capital gains and recent signs that that housing market is weakening. A $25,000 to $30,000 dollar saving could be wiped out over the next year if property prices trend lower. In Sydney, where the median dwelling value is $909,600, it would only take a fall of 2.75% before the $25,000 saving evaporates. In Melbourne, where housing market conditions have been more resilient, dwelling values would need to fall by approximately 4.3% before the $30,000 dollar stamp duty concession is wiped out. Of course, most first home buyers will be in the housing market for a long period of time and across several cycles. Time tends to heal all wounds, and for many, getting a foot in the housing market door via saving for a deposit and funding the high transactional costs is often the hardest part for many prospective first home buyers. Despite the very real risk that values could move lower, I think first home buyers will continue to take advantage of the cost savings on offer. It’s not just Sydney and Melbourne where first home buyer activity is ramping up; most other states and territories are also seeing an acceleration of first home buyer participation. This rise in activity hasn’t been accompanied by an announcement of new stamp duty concessions or other incentives. 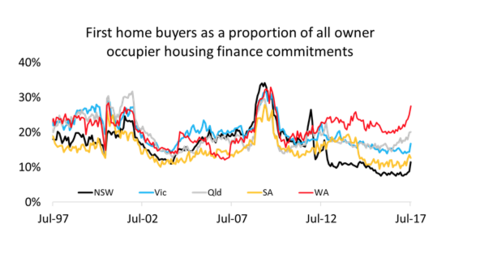 On this basis, the rise in first home buyer activity outside of New South Wales and Victoria is more organic and based on this segment of the market taking advantage of low mortgage rates and an increased appetite from banks to lend for owner occupation. The reduction in investor market activity is also likely to be contributing to higher levels of first home buyer competition as the first home buyers and investors tend to compete for similar housing stock. The pace of capital gains in most of these capital cities has been much more sustainable, if not negative, and the risks of a downturn are arguably less pronounced.